Country wedding ideas can transform your wedding day into a beautiful, fun event for you and your guests. Sometimes referred to as a western wedding, there are many options for a wedding day using this type of theme. Listed below is a lot of information for you about planning a country wedding, so you may want to bookmark this page so you can easily return to continue your research. While a country wedding can take place during any month of the year, the best time is usually spring, summer and fall as you can have both your ceremony and reception outside if you choose to. 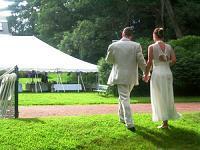 Tented weddings work especially well for country wedding ideas. Farms and even a spacious backyard can be the perfect setting for a tented affair. Other outdoor location options include farms, barns (old, remodeled, horse or tobacco), ranches, open fields and even campgrounds. Look for bed and breakfasts and inns that have gardens available for your wedding. If an outdoor wedding isn't your style, don't worry there are other country wedding ideas for locations. Many of the outdoor country wedding ideas listed also work for an indoor wedding event. A country church can serve as a romantic, indoor backdrop for your ceremony. Almost any indoor reception space can be transferred into a country atmosphere, but look around to find one that fits in best with your country wedding. Look for spaces that are already decorated with country flair. Ideas include an inside room at a bed and breakfast or inn, a country lodge, log cabin or any other space that offers a nice, country feel. Plantations can also be the perfect backdrop for your wedding, so if you live near one take advantage of it! Country wedding invitations are your first chance to let your guests know that you plan on having a country-themed wedding. There are many different designs that you can choose from, including country, western and floral varieties. Visit country wedding invitations for ideas and tips. Sunflower wedding invitations along with other garden flowers are other examples that can work really well. If you want to encourage your guests to wear country or western wear (which can be a lot of fun), you can list this on your invitation by simply stating that western wear is encouraged. Western wedding programs are a fun way to kick of your wedding ceremony. A traditional wedding dress is definitely acceptable for a country wedding, however a western wedding dress can also be the perfect fit. Western dresses typically consist of lace and are sometimes accented with pearls and sequins. Consider wearing a bridal hat. Many western dresses can be matched with hats that consist of lace, flowers and sometimes even a veil. Western bridal boots can finish off your wedding attire. Look for boots that are leather alone or leather with lace. For the groom, you can never go wrong with a tuxedo, but it doesn't have to be black. Consider a solid white tuxedo or one with a white jacket and black pants. Cowboy hats are a possibility during the ceremony, however another option is to hold off until the reception and have the groom and groomsmen wear them during the reception. As a bride you can wear one as well with your bridesmaids. A wedding theme is the perfect way to show off your country wedding ideas. 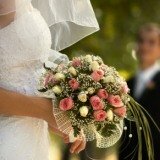 Visit western wedding ideas for all you need to know about having a western wedding. Sunflowers and garden flowers make excellent wedding themes. For even more theme ideas visit wedding theme idea to see a full list of theme ideas. When you think of country wedding ideas, colorful, wild flowers probably come to mind, and there are many great options when it comes to choosing flowers for your wedding. Daisies, tulips, snapdragons and other garden flowers are always favorites, and they come in a variety of warm, bright colors. Work with your florist to come up with the right flower combinations for your bouquets, centerpieces and other decorations. Centerpieces are an important part of your wedding reception decorations. Floral centerpieces are the most popular type, however you can put a country twist on them to make them unique. Use unique containers like old cowboy boots, hurricane vases, mason jars and watering cans to hold the flowers. Finish off the containers with ribbon for a country touch. Other country items can be used in your centerpieces as well, such as horse shoes, small bales of hay, spurs and other western items. 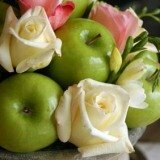 Use these items in combination with flowers and candles for a fun centerpiece. Place your centerpieces on top of red and white checkered table cloths or solid white with red overlapping tablecloths to finish off your reception tables. The idea, obviously, is to create a country atmosphere for your wedding. That typically means using decorations like hay bails, country flowers and other western items. Your reception food can be as formal or casual as you would like. Look for caterers that specialize in the type of food you would like to serve at your reception. Barbecue and cocktail receptions can be less formal and allow your guests more time to mingle and dance. Family style dining is another option, with the food served in large bowls that everyone at the table shares. For entertainment, find an energetic country/western band that will entertain your guests. Ask if they can supply an MC, or hire someone else, that will get the guests involved and teach them line dances. For hours of fun consider renting a mechanical bull. Just be careful that your guests aren’t too drunk to ride it! Your cake can be decorated with beautiful flowers or even a country wedding cake topper. In addition to your cake you can let your guests create smores at their tables. Burners, like you can find at many coffee shops these days, can be rented, or they can purchased online or at many home stores. Finally, country wedding ideas aren’t complete without a signature drink. There are many great options for this type of wedding including Lynchburg lemonade, mint julep and any drink that contains bourbon or whiskey. For some extra fun, label your signature drink as moonshine!